The 21st century has witnessed the liberation of publishing practices. Digital technologies have brought the printing press to the masses. Who gets to publish and when, the medium used and the channels through which information is consumed have all changed drastically. An ever accelerating development of emergent technologies has led to a wide array of emergent publishing practices, be it in the form of longreads, vlogs, zines, collaborative platforms or print-on-demand – all the while leaving the status of and love for paper books intact. A plethora of tools, applications, infrastructures, models, and hacks thus makes many futures of publishing possible. How to realize sustainable, high-quality alternatives within this domain of post-digital publishing? Liberation comes with its downsides: while the availability of publishing technologies has helped bring different voices onto the stage, connect new communities and identify hegemonic intersections of power, they have also played a role in bringing about what is known as the ‘post-truth era’. Critical interventions have been somewhat self-referential and concentrated on the needs and demands of people and communities engaged in the history of art or avantgarde publishing. In the meantime, the scale and scope of once emergent publishing practices have exploded, leaving a disenchanted public to scavenge the rubble of breaking fake news stories, information pollution and broken links. Speed and availability of publications may have increased, but the quality of the information presented and of its containers lags behind. Admission: free, but registration is required. Lunch and dinner are included. Inventing new ways of publishing between fast populism and slow academia. How to counter misinformation and stimulate open public discussions through a speedy publishing process, high quality content and spot-on positioning? With Padmini Ray Murray (IN), Morten Paul (DE), Nikola Richter (DE) and Clara Balaguer (PH), moderated by Florian Cramer (NL). Presentations and panel discussion with Janneke Adema (UK) & Gary Hall (UK), Lídia Pereira (PT) and Axel Andersson (SW), moderated by Miriam Rasch (NL). What promises do modular and non-linear publishing hold for writing and reading, research and collaboration? What potentialities of collectivity, collaboration and commons can hybrid publishing processes set free? How would that challenge existing roles and practices? Modularity in form and process, after proving itself in software development, has conquered the world at large. It fits the dynamics of the market and allows us to communicate in bits and pieces, fierce, hyped-up and snappy. Efficient medium, efficient messages. But modularity and non-linearity also contain a notion of critique. They can challenge myths of origin and originality, authoritarian authorship, single-voiced narratives, hero perspectives and definitive truths. They can inspire a ‘Carrier Bag Theory of Non-Fiction’: publications holding grains of knowledge and experience of various kinds and species, which can be laid out in different ways and directions. How would these forge meaningful connections and complex relations between contents, people, places and futures? Presentations and panel discussion with Silvia dal Dosso (IT) & Noel David Nicolaus (DE), Isabel Löfgren (BR), Evelyn Austin (NL) and Clara Balaguer (PH), moderated by Inte Gloerich (NL). However trivial and frivolous the meme might seem, its function as a cultural and communicative object deserves investigation. The meme can bear witness to shifts in language and cultural norms. Memes can function as political agent: spread like a virus and change sentiment, become a talking point, or set an agenda. Are memes the ammunition of online culture wars? Have they contributed to the normalization of the alt-right? How to study these symbols and tropes, and how to create our own? Using memes as a starting point, we look at online visual culture and how different popular communication styles have been incorporated into strategies of far-right movements. What are innovative ways to counter these movements on a transnational level? And how does the passing of Article 13 in the European Parliament affect our ability to freely express ourselves online? Presentations and panel discussion with Alice Twemlow (NL), Marc van Elburg (NL) and Krista Jantowski (NL), moderated by Geert Lovink (NL). What remains of a publication after it has been published? How does its status change in the post-production phase? Does it survive and thrive or will it suffer a slow, unimportant death? Some works keep circulating, others do not. Fragments will live on in search engines, on platforms, or in physical space, aggregated, fragmented, or re-contextualized. How does the materiality, positioning and design of the work influence this afterlife? How to design for sustainability of the publication? We need to consider the constellation of readers, publishers, designers and editors. Why are we even publishing and for whom? What does it mean to actually read nowadays? Why are aspects of time and space important in the positioning of a publication? When we shake off the idea of the book as a static object, we can start to look at other aspects of publishing: social, emotional, material and spiritual. The echoes of the afterlife will reverberate through new publishing strategies. Please note that there are limited places available in the workshops, if you did not register for a workshop we cannot guarantee a spot for you. No prior knowledge is needed, although you might be required to bring a laptop or phone, check the specifications in the workshop descriptions. By Amy Pickles (UK) and Cristina Cochior (RO). Say it ain’t so is a sound to voice to speech making, recording, arranging and announcing workshop. 1. The production and bundling of sounds from non-digital sources through group work and individual recording. We will produce work in our throats and transmit it with our mouths. 2. We will make use of speech to text software to move voice to speech, and incorporate the errors that emerge during the transformation. 3. With the basic computer text processing technique called Bag of Words, we will create new orders looking at frequencies of – what the algorithm perceives to be! – words. The day will culminate in presentations of our Bags, new forms we make in groups of the debris from our workshop. How can we disrupt the algorithmic tracking of our voices and language in the “cacophony of digitally distributed voices” (Dankert & Panekoek) in which we reside, where everywhere “directing attention becomes a political act” (ibid). Materials Needed – a recording device such as a phone and/or laptop. Headphones to listen to recordings on your phone and/or laptop. How do we consume? How do we get influenced? How do we protest? This workshop is aimed at creating a collective lexicon of personal viewpoints towards the influence of the ubiquitous technology around us, by drawing attention to those implementations that are so vowed into our daily lives that they normally go unnoticed. The intangibility and unclarity of where and how exactly digital technology works and affects us, evokes the uncanny feeling of a loss of control, a sense of frustration and anxiety. By investigating and collectively mapping emotional responses to technology and their behavioral implications each participant extracts inspiration for a personal protest statement, that will be published in the directly surrounded public space. The collective “research through making” approach mixes fast speed visual and textual assignments with performative elements that require quick responses that do not allow over-rationalization or over-explanation of behind lying constructs and promote production of associative and subconscious ideas. By exposing the seemingly trivial daily urgencies in life, we can stop asking questions and make strong and profound statements to counter them. After the workshops we go to Motel Spatie for dinner and presentations. 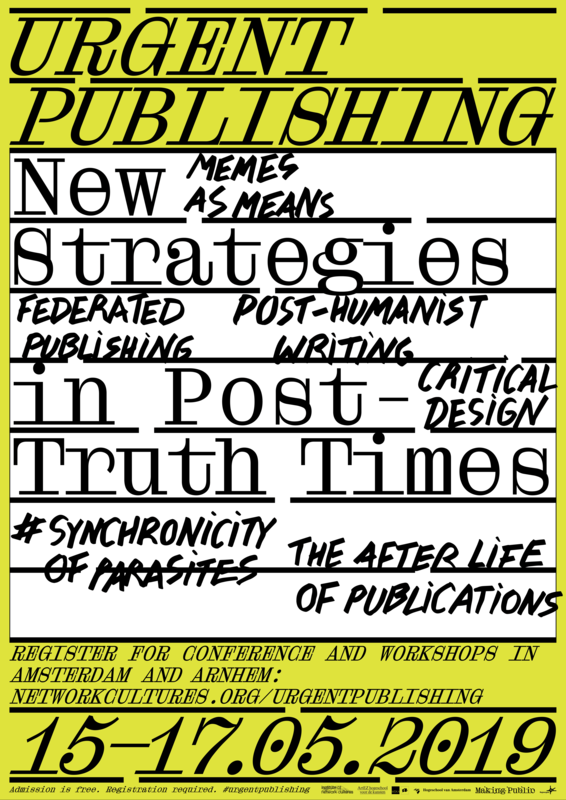 The evening #synchronicityofparasites is organised by Marc van Elburg of the Zinedepo in Motel Spatie, Arnhem. Working with theories on the parasite as a metaphor for media culture, Marc found himself in a hotel in Ljubljana one day right next to an artspace called P.A.R.A.S.I.T.E. which he did not previously know of. This coincidence can be explained by the inherent synchronicity of parasites, which is probably also why we planned our publishing conference on the exact same day as Marc’s event! Join us for a dinner prepared by People’s Kitchen SPOON at Motel Spatie in Presikhaaf. The evening includes a 5-course Mexican dinner which is free if you hand in your conference badge!